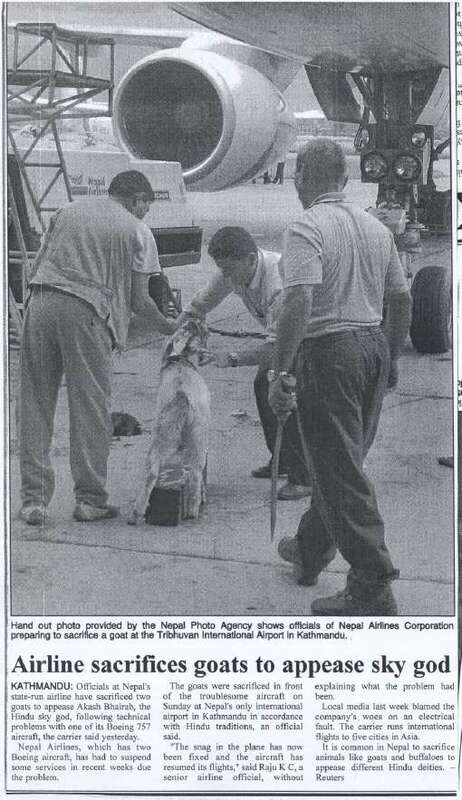 I delivered a new Seneca IV to Egypt back in 1993 and the first thing the new owner did when he got the plane was to have a witch doctor, or whatever they are, kill a goat and smear its blood all over the tail. I couldn’t believe it! They left the blood on the plane and wrecked the brand new paint job. Bunch of savages. My luggage is the only thing that get’s sacrificed to deities of Delta and United and I don’t think that counts. I would certainly wonder what was on the menu in first class after witnessing that spectacle before boarding the plane. It’s sort of a big deal when I fly a few states away but Egypt qualifies as a real “cross country” flight. Question might be: Who’d want to get into a plane with blood all over it? Not me. Good story. Between overseas airplane deliveries and dropping meat bombs you might have material for an interesting aviation book. funny you should ask, I’m almost done with a book about my ferry flying days. If you would like to help me out and read a chapter or two and give me some feed back I would appreciate it. If you are interested shoot me an email and I’ll send you some of my third grade chicken scratches. I’d be delighted to look at any part of your manuscript. Not that I’m an expert. I’m sure it’s a great read but I’m also biased since I like general aviation adventures.